Thiruvairanikulam Mahadeva Temple is a famous Lord Shiva and Goddess Parvati temple located about 15 km south of Aluva, in Ernakulam district of Kerala. The presiding deity is Lord Shiva, who is worshipped as Mahadeva. The Lord faces east and the separate shrine for Goddess Parvati facing west in the same sanctum. The unique feature Thiruvairanikulam Temple is that the shrine of Lord Shiva is open all round the year; but, the temple of Parvathi is open only for 12 days in a year. 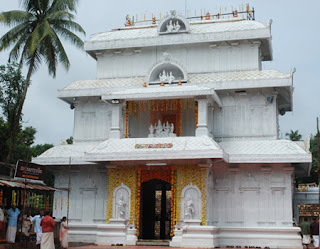 The shrine of the Goddess Parvati is opened during the Malayalam month of Dhanu (mid December – mid January), beginning from the Thiruvathira nakshatram, the birthday of Lord Shiva. A grand festival is celebrated at the Thiruvairanikulam Shiva Temple during the opening period called as Nadathurappu Mahothsavam. In 2016, as Thiruvathira naskhtram on Dhanu month falls on January 2017 only, the Thiruvairanikkulam Mahadeva Temple Nadathurappu Mahothsavam festival starts on 11th January 2017 and ends on 22nd January 2017. The temple is situated near a village called Srimoola Nagaram, in the banks of river Periyar. A Mandapam in front of the Lord Shiva has an idol of the Rishabam, the celestial bull, which is seen facing the Lord. Lord Ganapathy is seen in the nearby lawn, facing east. Other deities found here are Lord Dharmasastha (Swami Ayyappa), Lord Mahavishnu, Goddess Satidevi and Goddess Durga. It is believed that the temple was found during the period of Agnihotri - one among the legendary Parayi Petta Panthirukulam. Lord Shiva is offered with four pooja services including one Naivedyam. The celestial bull, unlike in other temples, cannot be touched by devotees or even by the Kazhaka (one who maintains the temple surroundings), except by the Thantris or Brahmins who are permitted to do so. A cleansing ceremony is performed if somebody touches the bull. During these 12 days of Nadathurappu Mahothsavam festival at Thiruvairanikkulam Temple, the sanctum is opened for the public and the Goddess Parvathi is decorated in oriental silks. Various offerings are made to the deity such as Pattu Saree and wedding Thali (necklace), turmeric powder, Swayamvara Archana (pooja performed to remove marriage obstacles), Valkannadi (a unique mirror found only in Kerala), Nelpara, Malarpara, Aripara, Sarkara para, offerings in the form of oil lamps, Thrimadhuram and Brahminipattu. Click here to check the timings or visiting hours of Parvati shrine at the temple during festival occasion. An 8-day festival is carried out during Sree Krishna Jayanthi, the birthday of Lord Krishna. Bhagava Sapthaham, the life story of Krishna, is recited during the festival. Other Hindu festivals such as Pradishta Divasam (day of deity installation) during the month of Midhuna (Punartham nakshatram), Mandala festival, Vishu Kani, Naaga Pradishta, and Navarathri are celebrated here. Devotees can reach Thiruvairanikulam Temple by traveling 10 km from Desom Junction between Aluva and Angamaly, in the NH 47, to reach Sreemoola Nagaram and then about 1.5 km through Vallom road. From there devotees travel through Akavoor-Thiruvairanikulam road. The temple is reached from Kalady in the MC Road. Buses are available from Aluva, Perumbavoor, Angamaly, Chalakudi and Ernakulum to the temple. Aluva Railway Station, situated in the heart of Aluva town, is the nearest railway station to reach Thiruvairanikulam. Some of the major trains passing through Aluva Railway Station include Netravathi Express (Thiruvananthapuram – Lokmanyatilak), Thiruvananthapuram - Howrah Express, Kochi - Hyderabad Express, Alappuzha Bokaro Express, Venad Express (Trivandrum – Shoranur), Parasuram Express (Trivandrum - Mangalore ), and Sabari Express (Trivandrum - Hyderabad Decan), Amritha Express (Trivandrum – Palakkad), and Guruvayur Express (Chennai Egmore – Guruvayoor). Cochin International Airport at Nedumbassery is the nearest airport to reach the temple. Nedumbassery Airport is 25 km north-east of Kochi. Aluva Mahadeva Temple, Uliyannoor Madathilappan Mahadeva Temple, Sree Vaikathappan Temple, Chengamanad Mahadeva Temple, Lakshmana Perumal Temple, and Parur Venkatachalapathy Temple are some of the famous temples in and around Aluva. Chottanikkara Bhagavathy Temple, Sree Poornathrayesa Temple, Chittoor Srikrishna Swami Temple, and Kadungalloor Sree Narasimhaswami Temple are within a short drive from Thiruvairanikulam.